Summer is in full swing. The pools are open, the beach beckons, and cold beer tastes just a little bit better than it does during the rest of the year. 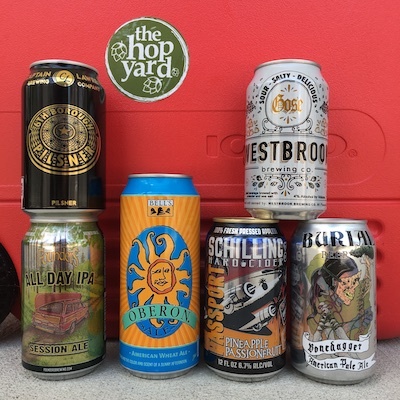 The Hop Yard has sipped the suds in search of our favorite beers for the hotter weather and we've narrowed the list down to six of our very favorite. Whether you're a fan of the lighter beers, something tart, something hoppy, we've got a craft beer or two to help you stay cool during this North Carolina summer. Grab your cooler, fill it with ice, then stop by The Hop Yard to load up before your next trip to the pool, beach, or summer BBQ. Bell's Brewery from Comstock, MI, has gained an almost cult-like following for their spring/summer seasonal release of Oberon. Fans of this craft beer countdown to its yearly release with a fervent reverence normally reserved for big barrel-aged stouts and hazy IPAs. It's a wheat ale that mixes a spicy hop character with mild fruity aromas. The generous amount of wheat lends smooth mouthfeel which is perfectly suited for poolside and porch sipping. It's 5.8% ABV and The Hop Yard carries Oberon in 16oz cans, 4-packs, very limited quantities of the 5L mini keg, and occasionally on draft. The Hop Yard loves their hoppy beers but when the summer hits we're often searching for suds with a little less bite. Thankfully Captain Lawrence Brewing Company from Elmsford, NY, offers up a twist on the traditional golden lager beer. Their 6th Borough Pilsner is dry hopped with Mosaic and Crystal to give this crisp, bright beer a hint of citrus atop the clean maltiness and just a hint of pepper-like spice. It clocks in at 5% ABV and The Hop Yard carries 6th Borough Pilsner in 12oz cans, 6-packs, and occasionally on draft. When Founders Brewing Company from Grand Rapids, MI, released All Day IPA back in 2012, they knew they were onto a hit. Session brews were beginning to catch on in the craft beer world with an increasing number of drinkers looking for a well-made, complex beer at a low enough ABV to enjoy in quantity. Initially released as a warm weather seasonal offering, the beer's popularity led Founders to eventually brew it year round. The beer sports a clean finish but enough complexity in the aromatics and mouthfeel to provide a bigger experience than you might expect from a 4.7% ABV IPA. The Hop Yard stocks Founders Brewing Company's All Day IPA in 12oz cans, 6-packs, and occasionally on draft. 15-Packs are available for special order (minimum 48 hour notice). We initially featured Schilling Hard Cider's Passport: Pineapple Passionfruit in our cider tasting notes article last fall. This cider's bold pineapple flavor set atop the backdrop of a slightly tart passionfruit note caught our attention back then and still resonates today. It's the juiciest of the ciders we carry and clearly features a tropical, fruit-forward vibe that's tailor made for a day spent poolside or sipping by the beach. The Hop Yard carries Schilling Hard Cider's Passport: Pineapple Passionfruit in 6-packs and 12oz cans. The Hop Yard and its customers are well-versed in the beers cranked out by Burial Beer Company in Asheville, NC. We've made many a trek to their downtown tasting room and regularly feature their beer on tap and on the shelves. Three varieties of wheat in the malt bill give this Pale Ale a New England-style/hazy vibe and a heavy hand of Citra and Simcoe hops plus lupulin powder push the style boundaries with nods to the dank and peachy end of the flavor spectrum. The Hop Yard stocks Burial Beer Company's Bonedagger American Pale Ale in 6-pack, 12oz cans and occasionally on draft. The craft beer world has embraced the once nearly-extinct German-style sour wheat beer and we're seeing more and more Gose (pronounced "Gose-uh") pop up from brewers around the country and around the world. Westbrook's take combines a citrusy tartness with a salty/savory mineral component that's intriguing and refreshing. Look for their Key Lime Pie and Lemon Cucumber variants, too. The Hop Yard offers Westbrook Brewing Company's Gose in 6-packs, 12oz cans, and occasionally on draft. Lemon Cucumber and Key Lime Pie variants come in 4-packs of 12oz cans.